Mitochondrial dysfunctions play major roles in ageing. How mitochondrial stresses invoke downstream responses and how specificity of the signaling is achieved, however, remains unclear. We have previously discovered that the RNA component of Telomerase TERC is imported into mitochondria, processed to a shorter form TERC-53, and then exported back to the cytosol. Cytosolic TERC-53 levels respond to mitochondrial functions, but have no direct effect on these functions, suggesting that cytosolic TERC-53 functions downstream of mitochondria as a signal of mitochondrial functions. Here, we show that cytosolic TERC-53 plays a regulatory role on cellular senescence and is involved in cognition decline in 10 months old mice, independent of its telomerase function. Manipulation of cytosolic TERC-53 levels affects cellular senescence and cognition decline in 10 months old mouse hippocampi without affecting telomerase activity, and most importantly, affects cellular senescence in terc−/− cells. These findings uncover a senescence-related regulatory pathway with a non-coding RNA as the signal in mammals. Qian Zheng and Peipei Liu have contributed equally to this work. The online version of this article ( https://doi.org/10.1007/s13238-019-0612-5) contains supplementary material, which is available to authorized users. Human mitochondrial dysfunctions are linked to ageing related health problems such as metabolic defects, neurodegenerative diseases, and self-immune diseases (Bishop et al., 2010; Lopez-Otin et al., 2016; Sun et al., 2016). Mutations that affect mitochondrial bioenergetics and biosynthesis have been shown to modulate signaling pathways and gene expression through mitochondrial retrograde signaling (Wallace, 2012; Guha and Avadhani, 2013). The most well studied mitochondrial retrograde signals are calcium ion and ROS (Kotiadis et al., 2014; Sullivan and Chandel, 2014; Reczek and Chandel, 2015; Gottlieb and Bernstein, 2016). 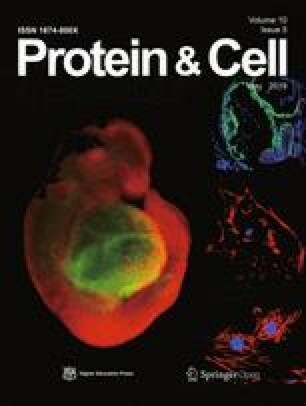 A decrease in calcium import into mitochondria increases cytosolic calcium concentration, which leads to transcriptional upregulation of over 100 genes including those involved in glucose metabolism, apoptosis and tumorigenesis (Kotiadis et al., 2014; Gottlieb and Bernstein, 2016). Mitochondrion-produced ROS initiate signaling in cellular processes such as proliferation, antioxidant gene regulation, apoptosis and aging through redox mechanism (Sullivan and Chandel, 2014; Reczek and Chandel, 2015). Both Ca2+ and ROS, however, lack specificity as signaling molecules. How mitochondria regulate a cellular process through retrograde signaling specifically remains relatively unexplored. The roles mitochondria play during ageing are more complicated than originally expected. Mitochondrial dysfunctions contribute to different aspects of ageing including cellular senescence, decline of stem cell activity and inflammation (Sun et al., 2016). Mitochondrial impairments trigger mitochondrial unfolded protein responses and mitophagy that also have protective effects and in turn may extend longevity in model organisms such as C. elegans (Yee et al., 2014; Schulz and Haynes, 2015; Sun et al., 2016). These processes are regulated by a complex network of signaling pathways, and the intricate interplay and co-regulation only start to unfold. Mitochondria import a variety of cytosolic non-coding RNAs, including tRNAs, rRNAs, microRNAs and lncRNAs (Chang and Clayton, 1989; Alfonzo and Soll, 2009; Wang et al., 2010; Mercer et al., 2011; Zhang et al., 2014; Cheng et al., 2018). The import pathway is partially characterized in mammalian cells with PNPASE, a mitochondrial IMS (intermembrane space) protein, as an important regulator (Wang et al., 2010; Vedrenne et al., 2012; von Ameln et al., 2012; Sato et al., 2017). The mitochondrial functions of most imported RNAs, however, are unclear. We have previously discovered that the RNA component of Telomerase TERC is imported into mitochondria, processed to a shorter form TERC-53 by mitochondrial RNASET2, and then exported back to the cytosol (Cheng et al., 2018). Cytosolic TERC-53 levels respond to mitochondrial functions, but have no direct effect on these functions, suggesting that it could function as a mitochondrial retrograde signal (Cheng et al., 2018). 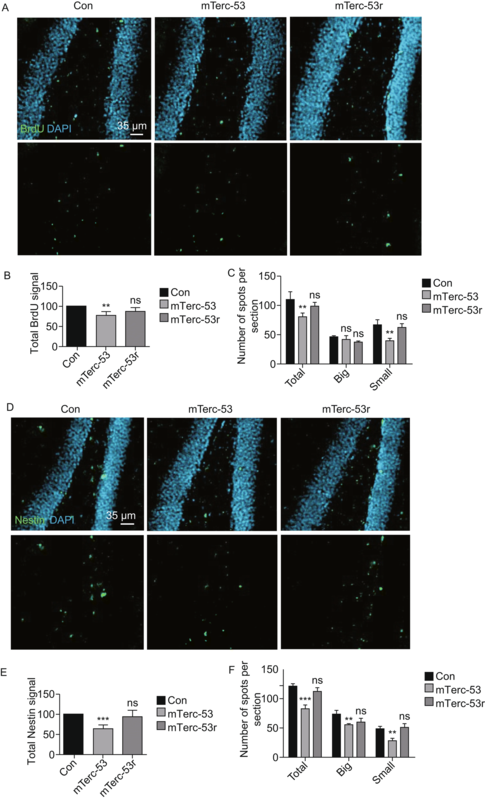 Here, we show that cytosolic TERC-53 regulates cellular senescence and is involved in cognition decline in 10 months old mouse hippocampus without affecting telomerase activity or mitochondrial functions, possibly through regulating nuclear gene expression. 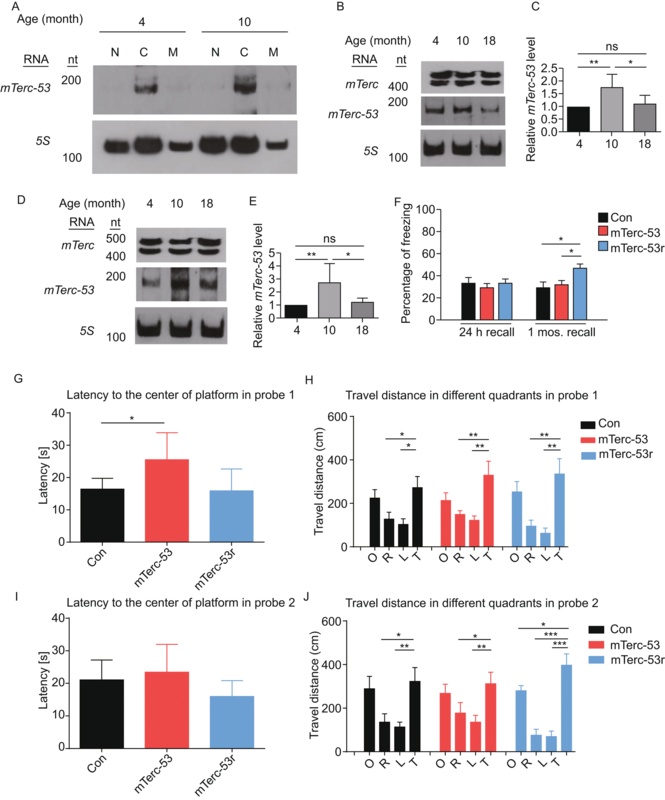 These findings demonstrate that a non-coding RNA functions as a specific signaling molecule, a potential general mechanism, and provide a mechanism on how mitochondria regulates cellular senescence and possibly organismal ageing in mammals. We have previously shown that the RNA component of Telomerase TERC is imported into mitochondria, processed to a shorter form TERC-53, and then exported back to the cytosol (Cheng et al., 2018). In the cells, TERC-53 is localized predominately in the cytosol. Cytosolic TERC-53 level responds to mitochondrial functions, but has no direct effect on these mitochondrial functions (Cheng et al., 2018). To investigate the function of cytosolic TERC-53, we stably overexpressed the RNA in 2BS (a primary strain of human embryonic lung fibroblast) cells with H1 promoter (Figs. 1A and S1A). Consistent with the previous results (Cheng et al., 2018), hTERC-53 overexpression led to a two fold increase of the cytosolic hTERC-53 level, but had no effect on hTERC level (Fig. S1A). hTERC-53 overexpressing cells showed a significantly faster senescence rate (Figs. 1B and S1D). Full length hTERC overexpressing cells also showed a similar phenotype, even though to a lesser extent (Fig. 1B), possibly the result of hTERC-53 accumulation due to overexpression of the full length RNA (Fig. S1B). An impact on cellular senescence, however, could be the results of many factors and the hTERC-53 effect could be indirect. To explore these alternatives, we constructed a stable cell line expressing anti-sense hTERC-53 (hTERC-53r). Expression of hTERC-53r significantly reduced the cytosolic hTERC-53 level, but had no effect on hTERC level (Fig. S1C), leading to a slowdown of the senescence rate (Figs. 1C and S1E). Expression levels and modifications of cellular senescence markers were examined in the cells. An increase of p16 protein level was observed in hTERC-53 overexpressing cells (Fig. 1D). Interestingly, the expression levels of many pro-longevity factors such as SIRT proteins were also upregulated and the inhibitory modification of MnSOD was removed in hTERC-53 overexpressing cells, suggesting a compensatory response (Fig. 1D and 1E). Expression of hTERC-53r led to minor downregulation of the expression levels of the senescence markers such as p-AMPK and p16, and removal of the inhibitory modification of MnSOD (Fig. 1D and 1E). It remains to be elucidated how expression of hTERC-53 and its antisense RNA could lead to the similar effect on MnSOD modification. However, overexpression and knockdown having similar effect is not uncommon with protein expressing genes (Phadke et al., 2011); Nicholls et al., 2012); it could also be the case with non-coding RNA regulation. These results also indicate that the role of TERC-53 during cellular senescence is more regulatory than causative. It has been shown previously that PNPASE overexpression exacerbates cellular senescence (Sarkar et al., 2003). PNPASE is involved in TERC trafficking into mitochondria where it is processed to TERC-53 by RNASET2, and PNPASE overexpression leads to an increase of cytosolic hTERC-53 level (Liu et al., 2017; Cheng et al., 2018). The increase of cytosolic hTERC-53 level by PNPASE overexpression is not due to a drop in the RNA degradation rate, as cytosolic hTERC-53 showed a faster degradation rate in PNPASE overexpression cells (Fig. 1F). To examine whether cytosolic TERC-53 is involved in PNPASE’s function in cellular senescence, hTERC-53r was expressed in the PNPASE overexpressing cells. The increase of senescence rate and p16 level caused by PNPASE overexpression was mostly reversed by hTERC-53r (Fig. 1G–I), further proving the involvement of TERC-53 in cellular senescence. Since TERC is the essential RNA component of telomerase (Gall, 1990), we investigated whether TERC-53 functions by interfering with telomerase activity. The level, localization and activity of telomerase protein TERT were examined in hTERC-53 overexpressing and control cells. 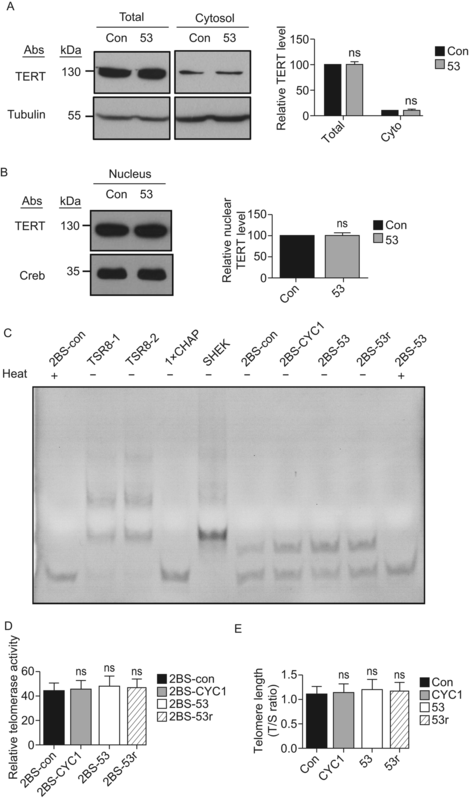 No significant difference of TERT level was observed in either the cytosol or the nucleus between hTERC-53 overexpressing cells and the control cells (Fig. 2A and 2B). Cell lysates from 2BS cells expressing CYC1, hTERC-53r or overexpressing hTERC-53 all showed weak but similar level of telomerase activity (Fig. 2C and 2D). Telomere length was also examined in the 2BS cell lines, and no significant difference was observed (Fig. 2E). To further examine whether TERC-53 functions by interfering with the functions of full length TERC, MEF cells were isolated from second generation terc−/− embryos or control wild-type embryos, and infested with adenovirus for the expression of CYC1, mTerc, mTerc-53 or mTerc-53r. Consistent with the 2BS cell results, mTerc-53 overexpression accelerated wild-type MEF cell senescence and an increase of p16 protein level was observed in mTerc-53 overexpressing cells (Fig. 3A–D). mTerc-53r had only minor effect on the mTerc-53 level (Fig. 3E), hence a lack of rescue effect on senescence. More importantly, mTerc-53 also accelerated senescence of terc−/− MEFs (Fig. 3A–D). No deceleration of senescence of terc−/− MEFs by expression of mTerc was observed, possibly due to the fact that mTERC deletion only has minor effect on cellular senescence in early generations (Blasco et al., 1997), and that introducing mTerc later in proliferation in the wild-type cells actually increased the level of mTerc-53, hence the negative effect outweighing the positive effect. Telomere length was examined in the wild-type and terc−/− MEF cell lines. As expected, the telomeres in the terc−/− MEFs were shorter than the wild-type MEFs, but expression of CYC1, mTerc, mTerc-53 or mTerc-53r in these second generation MEFs had no significant effect on telomere length (Fig. 3F). These results suggest that mTerc-53 functions independent of full length mTerc and telomerase, and also provide an explanation for the lack of strong biological phenotypes in early generations of terc−/− mice (Blasco et al., 1997; Rudolph et al., 1999; Jaskelioff et al., 2011), as deletion of mTERC also eliminates the generally pro-senescence mTerc-53. It has been shown previously that mitochondrion-localized RNASET2 is involved in TERC processing, and that overexpression of RNASET2 leads to an increase of cytosolic TERC-53 level (Cheng et al., 2018). With the involvement of TERC-53 in cellular senescence established, we examined whether RNASET2 has a similar effect on cellular senescence as TERC-53 does, by overexpressing or knocking down the protein in MEF cells (Fig. 3G–L). 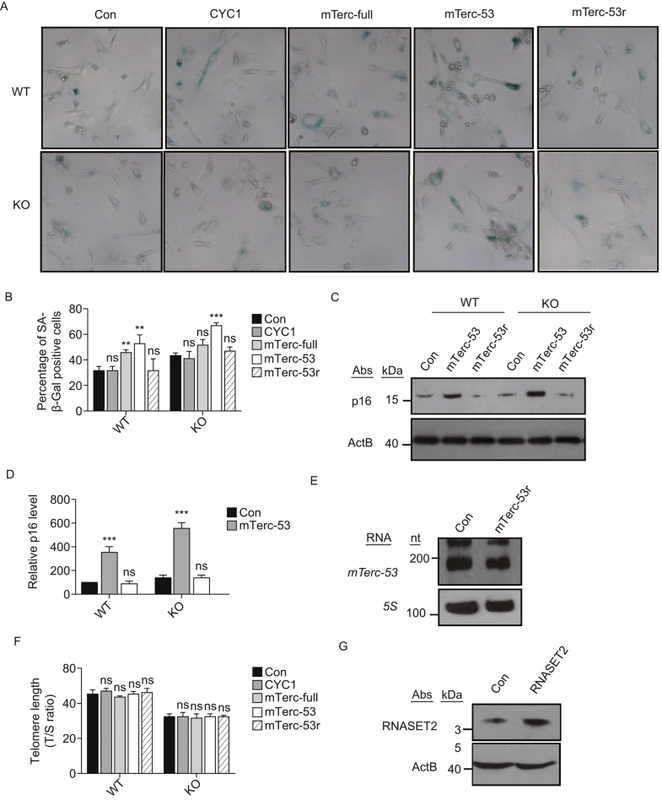 An acceleration of cellular senescence was observed with RNASET2 overexpression and a deceleration of senescence was observed with RNASET2 knockdown (Fig. 3G–L), consistent with a previous report that in human RNASET2 functions as a senescence inducing and tumor suppressor protein (Acquati et al., 2001), and providing a linkage between the processing and function of TERC-53. We proceeded to study whether there is a physiological connection of the TERC-53 function. Cytosolic mTerc-53 was observed in all mouse tissues examined (Fig. S2A). In cultured neuronal N2a cells, mTerc-53 also localizes mainly in the cytosol and the level is significantly higher than in MEF TM6 cells (Fig. S2B–D). Moreover, N2a mitochondria import mTerc more efficiently, even though PNPASE expression is not upregulated (Fig. S2E–G). Instead, higher TIM23 level was observed in N2a cells, suggesting a correlation between mitochondrial functional states and the processing and trafficking of mTerc (Fig. S2G and S2H). Next, the RNA level was examined in different age groups of mice. Majority of mTerc-53 localizes in the cytosol of the brain cells, consistent with the results in the cultured cells (Fig. 4A). A significant increase of the cytosolic mTerc-53 level was observed in the brains as well as the livers of the 10 months old mice compared to the 4 months old; but in the 18 months old mice, the level drops again to that of the 4 months old (Fig. 4A–E), which seems consistent with the responses of cytosolic hTERC-53 levels to different degrees of mitochondrial stresses (Cheng et al., 2018). The PNPASE level remains constant in all three groups, but an ageing-related mitochondrial protein BAP37 increases significantly in the 18 months old mice (Fig. S3A and S3B) (Coates et al., 1997), indicating changes of mitochondrial functional states as mice age. Transcription inhibitor triptolide treatment did not alter the pattern of mTerc-53 levels in the three groups (Fig. S3C), suggesting no clear change of the degradation patterns of the RNAs during this ageing period. As expected, the telomere length in the brain showed no significant difference among the three age groups (Fig. S3D). Taken together, these data suggest that mTerc-53 may play a regulatory role in organismal ageing. To further examine mTerc-53’s physiological functions, we decided to use mouse hippocampus as a model and use adenoviral gene delivery, to avoid interference of telomerase activity during development and maturation (Fig. S4A). Contextual fear conditioning (CFC) (Fig. S5A) and spatial learning (Fig. S6A) were performed in separate cohorts. For CFC, mice (10 months old) were trained four weeks after adenovirus injection. Three groups exhibited comparable acquisition of contextual fear memory in single trial 24 h after training, but significantly higher percentage of freezing was observed in mTerc-53r group mice in 1-month recall compared to the control group and mTerc-53 group (Fig. 4F). No difference of the exploratory area and travel distance was observed among the three groups, suggesting no changes in mobility (Fig. S5B and S5C). For spatial learning, mice were trained 8 weeks after injection. mTerc-53 group exhibited a slower learning curve to locate the hidden platform across 10 training days (Fig. S6A and S6B). The latency of mTerc-53 group to locate the platform in probe 1 was also significantly longer than the control group, suggesting a cognitive decline (Figs. 4G and S7). Each group preferred the Target quadrant to Left and Right quadrants, and the frequency of reaching the platform by each group was about equal, but the ratio of travel distance in quadrant T to that in quadrant L was significantly higher in mTer-53r group (Figs. 4H, S6C–E and S7). After three days’ rest, the ratio of travel distance in quadrant T to that in quadrant L remained significantly higher in mTer-53r group and the frequency of reaching the platform by mTer-53r group also appeared higher, suggesting a better retention of memory (Fig. 4I, 4J, S6C–E and S7). In summary, overexpression of mTerc-53r slowed down the cognitive decline in the 10 months mice, while mTerc-53 accelerated the decline of learning ability in the 10 months mice. The relatively milder effect of mTerc-53 could possibly be due to induction of the expression of mTerc-53r in the hippocampus as a potential compensatory mechanism (Fig. S4B). No effect by mTerc-53 or mTerc-53r was observed in 18 months mice, indicating an early intervention is required (Fig. S6F). To understand the role of TERC-53 in cognition decline in 10 months old hippocampi, immunohistochemistry was used to evaluate the hippocampi of the mice overexpressing mTerc-53 or mTerc-53r and the control mice. Although no clear difference was observed with FOX3/NeuN (Neuron marker) staining, or S100β (Glial marker) staining, differences were observed in both BrdU incorporation (cell proliferation) and Nestin (stem cell marker) staining (Figs. 5 and S8). In hippocampi overexpressing mTerc-53, both the total intensity of the signal and the number of the BrdU- and Nestin-positive spots decreased significantly, compared to the control hippocampi or those overexpressing mTerc-53r (Figs. 5 and S8), suggesting that a reduction of cell proliferation and exhaustion of stem cells could be the reason of cognition decline in the mTerc-53 overexpressing mice. No clear different was observed with COX/SDH (mitochondrial activity) labeling among the three groups, consistent with the previous finding that TERC-53 functions downstream of mitochondria and has little effect on mitochondrial functions (Cheng et al., 2018). To gain more mechanistic insight into the function of TERC-53, its effect on nuclear gene expression was examined. Total RNA were harvested from HEK293 cells overexpressing hTERC-53, hTERC53r or the control cells and analyzed using RNAseq. 87 differentially expressed protein coding genes with GFOLD >1 or <−1 were identified between hTERC-53 overexpressing and control cells, and 1,950 differentially expressed protein coding genes were identified between hTERC-53r overexpressing and control cells (Fig. 6A–D and Tables S1–4). qRT-PCR and RNAseq showed generally consistent changes (Fig. 6E). More importantly, qRT-PCR results of HEK293 RNA were also consistent with those of mouse hippocampus RNA (Fig. 6E and 6F). 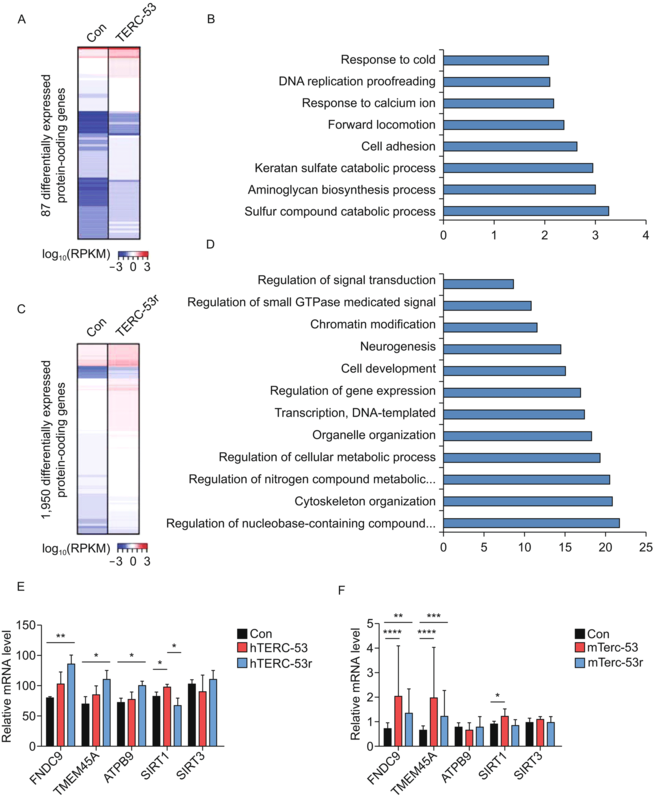 Gene ontology showed majority of differentially expressed genes were upregulated in TERC-53r overexpressing cells and mainly participate in several biological processes such as organelle organization, metabolism and neurogenesis, while the differentially expressed genes in TERC-53 overexpressing cells mainly participate in catabolic processes and stress responsive pathways, such as response to cold and calcium ion (Fig. 6B and 6D), suggesting that TERC-53 plays a regulatory instead of a causative role in senescence and ageing. TERC has been shown to interact with GAPDH in the nucleus, an important component of a gene transcriptosome, and nuclear translocalization is a key step for GAPDH to participate in the gene expression regulation (Sawa et al., 1997; Hara et al., 2005; Sen et al., 2008; Nicholls et al., 2012). Translocalization of GAPDH into the nucleus is induced by exposure of cells to environmental stressors such as starvation or treatment with Histone deacetylase inhibitor TSA (Trichostatin A), and plays an important role in DNA repair, autophagy and cell death (Chuang and Ishitani, 1996; Nagy et al., 2000; Azam et al., 2008; Chang et al., 2015). To examine whether TERC-53 could interact with the cytosolic pool of GAPDH and interfere with its nuclear translocalization or functions, GAPDH was purified and incubated with in vitro synthesized hTERC-53. A specific binding of GAPDH to hTERC-53 and hTERC but not control tRNA was observed (Fig. 7A and 7B). When TSA (Trichostatin A) was used to induce GAPDH nuclear translocation, in HEK 239 cells overexpressing hTERC-53, much less GAPDH signal was observed in the nucleus, compared to the control cells or the cells overexpressing hTERC-53r (Fig. 7C and 7D). 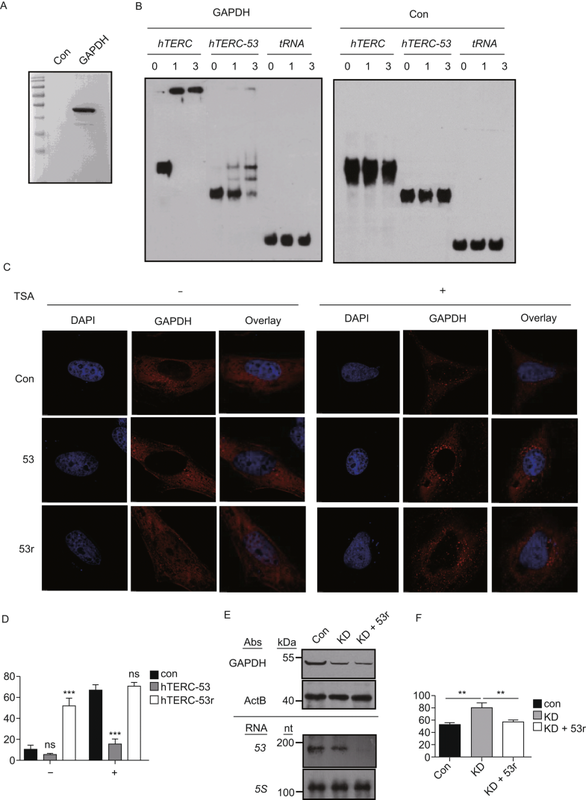 Interestingly, even without TSA treatment, GAPDH accumulated in the nucleus of the cells overexpressing hTERC-53r, suggesting that hTERC-53 functions by interfering with the nuclear translocation of GAPDH, and subsequently affecting nuclear gene expression (Fig. 7C and 7D). It has been shown previously that GAPDH depletion accelerates cellular senescence of a cancer line (Phadke et al., 2011). To examine whether TERC-53 plays a role in the process, hTERC-53r was expressed in the GAPDH knockdown cell line (Fig. 7E). As expected, GAPDH knockdown led to an increase of the senescence marker but depletion of hTERC-53 by expression of the antisense RNA partially reversed the effect (Fig. 7F), suggesting interfering with GAPDH nuclear translocalization as a mechanism of TERC-53’s function in cellular senescence. Mitochondria import a variety of cytosolic RNAs, but the functions of the majority of these RNAs in mitochondria are unclear. We have previously shown that the RNA component of Telomerase is imported into mitochondria, processed to a shorter form TERC-53, and then exported back to the cytosol (Cheng et al., 2018). The cytosolic TERC-53 level acts as an indicator of mitochondrial functions, but has no direct effect on mitochondria (Cheng et al., 2018). Our results in this report show that cytosolic TERC-53 regulates cellular senescence and is involved in cognition decline in 10 months old mouse hippocampi through a telomerase independent mechanism. We also provide a possible mechanism on how cytosolic TERC-53 regulates nuclear gene expression. We have shown here a non-coding RNA functioning as a signaling molecule for regulation of nuclear gene expression, which appears to play a regulatory role in senescence. Ageing in mammals is characterized by gradual loss of physiological functions. Mutations in mitochondrial DNA and mitochondrial dysfunctions have been established as one of the major factors in ageing (Lopez-Otin et al., 2013). Studies in mammals show an important correlation between nuclear gene expression and mitochondrial function changes during ageing (Lu et al., 2004; Bishop et al., 2010). How some mitochondrial dysfunction elicits certain nuclear gene expression change and how the specificity is achieved, however, is not clear. Our findings suggest that TERC-53 may function as a specific signaling molecule that bridges mitochondria and the nucleus. As the effect of mitochondrial dysfunctions on ageing is not simply causative, so is the effect of TERC-53. Modest reduction of mitochondrial function has been shown to activate a compensatory mechanism that increases stress resistance (Schulz and Haynes, 2015). Similarly, we have observed an induction of stress response pathways by TERC-53 overexpression. Cytosolic TERC-53 level responds differently to different levels of mitochondrial stress, it increased initially but then decreased as the stress increases. Similar changes were observed in mice as they age. These findings paint a complex picture of regulation networks during ageing in mammals. There is constant deterioration of the overall structures, as shown by accumulation of mutations in mitochondrial DNA and nuclear DNA, oxidation of the membranes, and so on; but there are also many coping mechanisms (Bishop et al., 2010). Noncoding RNAs may play a bigger role in ageing in mammals than expected. One of the most important finding of this study is that mTerc-53 accelerates cellular senescence of second generation terc−/− MEFs. TERC is the essential RNA component of telomerase, and the activity of telomerase plays a big role in cellular senescence (Gall, 1990; Bernardes de Jesus and Blasco, 2013). 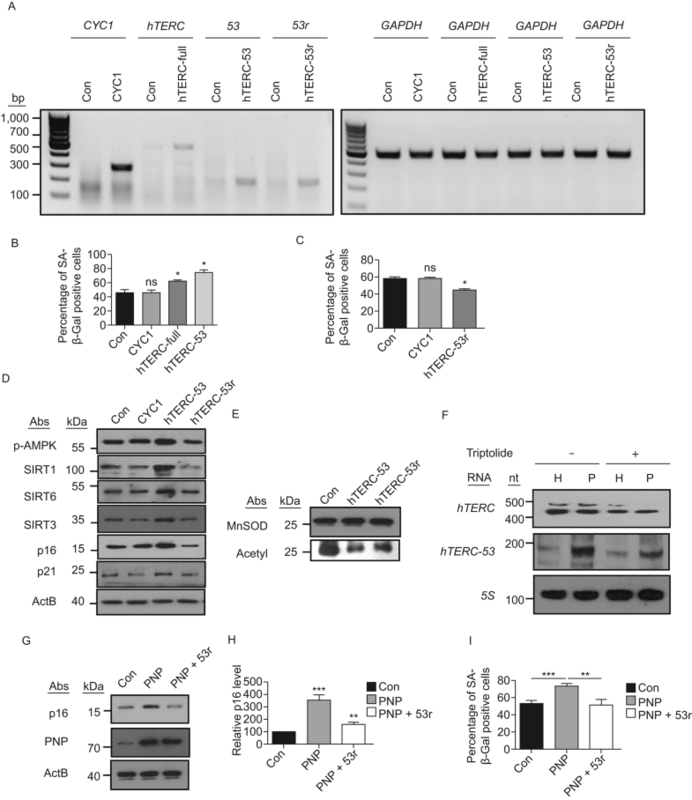 That exogenous expression of cytosolic TERC-53 has a similar impact on senescence of terc−/− cells as wild-type cells suggests TERC-53 does not function by interfering with telomerase activity. More importantly, it also provides an explanation for the lack of strong biological phenotypes in early generations of terc−/− mice. Full length mTerc, as an essential component of telomerase, has a pro-longevity function, while its processed form mTerc-53 is generally pro-senescence. Deletion of mTerc essentially eliminates the pro-senescence mTerc-53. The effect of TERC-53 in cognition decline seems to be caused by its effect on cell proliferation, at least in mouse brains, which is consistent with its function on cellular senescence. Although we have evidence showing TERC-53 regulates nuclear gene expression and the nuclear translocation of GAPDH, a key component of a transcriptosome, the molecular mechanism of TERC-53’s function in general and in cellular senescence remains to be fully elucidated. Mitochondria were isolated as previously described (Hachiya et al., 1993), except that mitoprep buffer (0.225 mol/L mannitol, 0.075 mol/L sucrose and 20 mmol/L HEPES pH 7.4) was used as the homogenization buffer and wash buffer. For cytosol isolation, post mitochondrial supernatant was first spun at 21,000 ×g for 10 min at 4 °C, and the supernatant was again spun at 100,000 ×g for 30 min at 4 °C. Nuclei and unbroken cells from mitochondrion isolation were pelleted at 800 ×g at 4 °C. The pellet was resuspended in the mitoprep buffer, homogenized again on ice, and pelleted at 800 ×g at 4 °C. The last step was repeated twice, before the pellet was resuspended in lysis buffer (10 mmol/L HEPES pH 7.5, 10 mmol/L KCl, 0.1 mmol/L EDTA, 1 mmol/L DTT, 0.5% Nonidet-40). The sample was kept on ice for 10 min, and nuclei were pelleted at 12,000 ×g for 10 min at 4 °C. 100 μg Mitochondria were treated with digitonin (90 μg/mg mitochondria) and 300 U micrococcal nuclease (Thermo) in 200 μL mitoprep buffer with 1 mmol/L CaCl2 for 25 min at room temperature. The reaction was stopped by addition of 5 mmol/L EDTA. Mitochondria were collected and solubilized in 100 μL SDS buffer (100 mmol/L NaCl, 1% SDS, 20 mmol/L Tris pH 7.4) with 10 μg/mL proteinase K and 5 mmol/L EDTA at 50 °C for 5 min. RNA was purified using 400 μL TRIzol reagent (Invitrogen), and treated with 500 U RNase-free DNase I (Thermo) in 50 μL buffer for 25 min at 37 °C. DNase I was inactivated with the addition of 5 mmol/L EDTA and incubation at 70 °C for 10 min. RNA was then purified with TRIzol. RNAseq samples and qRT-PCR samples were prepared the same way. RT-PCR was performed using the AccessQuick RT-PCR kit (Promega). For detection of hTERC, hTERC-111-f 5′-ACTTTCAGCGGGCGGAAAAGCCTCG-3′ and hTERC-198-r 5′-GCGAACGGGCCAGCAGCTGACATTT-3′ were used as primers, and for detection of GAPDH, GAPDH-f 5′-GAGTACGTCGTGGAGTC-3′ and GAPDH-r 5′-GGTCCACCACCCTGTTG-3′ were used. For detection of COX2, cox2-f 5′-CGGCCGCACCGGTGCACATGCAGCGC-3′ and cox2-r 5′-CGCGGATCCCTATGGTAAATACGGGC-3′ were used. For detection of CYC1, cyc1-f 5′-ATGACTGAATTCAAGGCCGGTTCTG-3′ and cyc1-247-r 5′-TCAACCCACCAAAGGCCATC-3′ were used. Phusion High-Fidelity DNA Polymerase was used for PCR of TERC and TERC-53. RNA was synthesized using MEGAscript SP6 Kit (Ambion). For radiolabeled RNA synthesis, [32P]-UTP was incorporated. For biotin-labeled RNA synthesis, biotin RNA labeling mix (Roche) was used. RNA was purified using TRIzol reagent. To make the construct pQsuper-hTERC-53 for HEK293 transfection, full length hTERC was first RT-PCR amplified from HEK293 total RNA with the primer pair: (hTERC-f) 5′-GGGTTGCGGAGGGTGGG-3′ and (hTERC-r) 5′-GCATGTGTGAGCCGAGTCCT-3′. hTERC-53 was then PCR amplified from full length hTERC with the primer pair: (Bgl2-hTERC-53-f) 5′-GAAGATCTTAACTGAGAAGGGCGTAG-3′ and (Xhol1-hTERC-247-r) 5′-CCGCTCGAGTGCGGGGTTCGGGGGCT-3′. The PCR product was digested with BglII and XhoI, and inserted into pQsuper vector. The pQsuper-hTERC-53r antisense construct and pQsuper-hTERCΔ1-63 were generated with the same method using the primer pair: 5′-CCGCTCGAGTAACTGAGAAGGGCGTAG-3′ and 5′-GAAGATCTTGCGGGGTTCGGGGGCT-3′ and the primer pair: 5′-GAAGATCTGGCGTAGGCGCCGTG-3′ and 5′-CCGCTCGAGGCATGTGTGAGCCGAGTCCT-3′. For 2BS cell transfection, pMSCV-hH1 vector was made. hH1 promoter fragment was cut from pQsuper vector with BamHI and XholI and inserted into pMSCV-puro vector digested with BglII and XholI to generate pMSCV-hH1. To make the construct pMSCV-hH1-cyc1, hH1-CYC1 fragment was cut from pQsuper-cyc1 and inserted into pMSCV-puro vector. With the same method, pMSCV-hH1-hTERC-full, pMSCV-hH1-hTERC-53 and pMSCV-hH1-hTERC-53r were also constructed. For mouse cell transfection, mTERC, mTERC-53, mTERC53r were PCR amplified using primers: 5′-GAAGATCTACCTAACCCTGATTTTCATTAGCTGTGG-3′ and 5′-CCGCTCGAGGGTTGTGAGAACCGAGTTCC-3′; 5′-GAAGATCTAGCTCCAGGTTCGCCGGGA-3′ and 5′-CCGCTCGAGGTCCTCGCGGCGCTCGC-3′; 5′-GAAGATCTGTCCTCGCGGCGCTCGC-3′ and 5′-CCGCTCGAGAGCTCCAGGTTCGCCGGGA-3′. The PCR products were digested with BglII and XhoI, and inserted into pQsuper vector. For bacterial expression of GAPDH, Pet28a-GAPDH-flag-his was generated using primers: 5′-CGCGGATCCATGGGGAAGGTGAAG-3′ and 5′-CCGCTCGAGCTCCTTGGAGGCCATG-3′, and BamHI and XhoI insertion. For colocalization study, PQCXIP-GAPDH-mCherry was generated using primers 5′-AAAACCGGTATGGGGAAGGTGAAG-3′ and 5′-CGCGGATCCACTCCTTGGAGGCCATG-3′, and AgeI and BamHI insertion. HEK293 cells, TM6 cells (Wang et al., 2010), 2BS cells (Li et al., 2011), MEF cells and N2a cells were cultured in DMEM supplemented with 10% fetal bovine serum. All cell lines used were tested for mycoplasma contamination. To generate HEK293 stable cell lines, HEK293T cells were transfected with VSVg and Hit60 packaging vectors and the vector of interest using TurboFect (Thermo). Harvested retroviruses were used to infect HEK293 cells, followed by selection with 5 μg/mL puromycin. To generate 2BS stable cell lines, phoenix cells were transfected with the vector of interest using CaCl2 transfection protocol. Harvested retroviruses were used to infect 2BS cells at 20 PDs, followed by selection with 0.5 μg/mL puromycin. RNASET2 overexpression and knockdown was performed as previously described (Liu et al., 2017). Cells were washed twice in 1× PBS, pH 7.4, and lysed in buffer A (10 mmol/L HEPES, pH 7.9, 10 mmol/L KCl, 1.5 mmol/L MgCl2 and 0.5% NP-40). Mitochondria were lysed directly in 1× SDS loading buffer. Protein lysates (50 μg) were resolved by SDS-PAGE, transferred to nitrocellulose membranes, incubated for 1 h with 5% milk TBS-T and overnight with primary antibodies in 5% BSA at 4 °C or for 1–2 h at room temperature. Antibodies included anti-PNPASE (1:5,000) (Chen et al., 2006), anti-TIM23 (1:1000) (Abgent), anti-Mortalin (1:10,000) (Sigma-Aldrich), anti-Creb (1:1000) (Abcam), anti-ActB (1:2,000) (ABClonal), anti-Acetylated lysine (1:1000) (Cell Signaling Technology), anti-TERT (1:1000) (Abcam), anti-p-AMPK (Thr172) (1:1000) (Cell Signaling Technology), anti-SIRT1 (1:500) (Santa Cruz Biotechnology), anti-SIRT6 (1:1000) (Cell Signaling Technology), anti-SIRT3 (Cell Signaling Technology), anti-p-NF-kB(Ser536) (1:1000) (Cell Signaling Technology), anti-p16 (1:1000) (Bioworld) and anti-β-Tubulin (1:2000) (Abcam). RNA was extracted from the nucleus, the cytosol or mitochondria using TRIzol reagent. 2 μg nuclear RNA, 5 μg cytosolic RNA and 0.5 μg mitochondrial RNA were loaded onto 6% polyacrylamide-8 mol/L urea gels, transferred to Amersham Hybond N+ membrane (GE) and hybridized with biotin-labeled RNA probes. For hTERC-53 detection, biotin-labeled hTERC-53 antisense RNA probe was used. For 5S rRNA, biotin-labeled full length 5S antisense RNA probe was used. Experiments were performed using North2South Hybridization and Detection Kit (Thermo). Senescence Cell Histochemical Staining Kit (Sigma) was used. Cells were washed twice in PBS and then fixed to plates using 1× Fixation Buffer for 6–7 min. After fixation, the cells were washed with PBS 3 times and incubated overnight at 37 °C without CO2 in freshly prepared Staining Mixture. For induction of HEK293 cellular senescence, cells were treated with 400 μmol/L of H2O2 for 24 h, and then grown in normal medium without H2O2 for 3 days before beta-Galactosidase Staining. Telomerase activity test was performed using TRAPEZE Telomerase Detection Kit (Millopore). Cells were lysed in CHAPS lysis buffer containing 200 units/mL RNase inhibitor. 1.5 μg cell extract were used per assay. The PCR products were analyzed on a 12.5% non-denaturing PAGE and detected by SYBR Green staining. 1–2 ng biotin labeled RNA was incubated with 0, 0.5, or 1.5 μg purified GAPDH in 10 μL binding buffer (150 mmol/L KCl, 25 mmol/L Tris pH 7.4, 5 mmol/L EDTA, 0.5 mmol/L DTT, 5% glycerol, 100 U/mL RNase Inhibitor (Thermo)) at 30 °C for 20 min. The samples were then kept on ice for 5 min; 10 μL of 2× RNA loading buffer was added to the mixture, and the samples were subjected to TBE gel electrophoresis. Hela cell lines stably expressing hTERC-53, or hTERC-53R, or harboring the empty vector were transiently transfected with PQCXIP-GAPDH-mCherry for 2 days. The cells were treated with 100 nmol/L TSA (ApexBio) or DMSO for 24 h, stained with DAPI, and then analyzed with a Zeiss confocal microscopy. MEFs were isolated as previously described (Jozefczuk et al., 2012) and cultured in DMEM containing 10% FBS and non-essential amino acids. On day 3, the cells were infected with adenovirus. After two days, the cells were treated with 2 μg/mL puromycine for 24 h. β-Gal assay was performed on day 9 with Senescence Cell Histochemical Staining kit (Sigma). Genomic DNA was extracted from tissues and cells with Multisource Genomic DNA miniprep kit (Axygen). For measuring telomere length, quantitative real-time PCR methods were used as previously described (Cawthon, 2009; Min et al., 2018). All animal studies were performed in strict accordance with guidelines of Chinese Association for Laboratory Animal Science. Protocols were approved by the Animal Care and Use Committee at Tsinghua University. C57BL/6 male mice were used to analyze the level mTerc-53 in the young and the old. The young were 4 months old and the old were 10 months old. The mice were divided into pairs randomly. One pair were sacrificed each time and the fresh livers and brains were used to isolated different cellular fractions. RNA was then isolated from these fresh samples and analyzed by Northern blotting. Biotin-labeled mTerc 37~204 bp antisense RNA probe was used to detect mTerc-53. 5S rRNA was used as internal control. The Northern blot results (n = 8 for each group) were analyzed with ImageJ software. For analysis of cytosolic TERC-53 levels in tissues, cells were isolated by treating tissues with 2 mg/mL Collagenases (Yeasen) (Type II for muscle and Type I for all the others) in regular growth medium before isolation of different cellular fractions. m-TERC53 and m-TERC53r expressing vectors were constructed with BLOCK-iTTM U6 RNAi Entry Vector Kit (Invitrogen) according to the supplier’s instruction, and the virus were produced, amplified and purified with BLOCK-iTTM Adenoviral RNAi Expression System (Invitrogen) according to the supplier’s instruction. Mice were maintained under standard housing conditions, and anaesthetized with Isoflurane (3 mL/h for 10 min to induce anaesthetization, 1.2 mL/h to maintain the anaesthetized state). Mice were placed in the stereotaxic apparatus and a small hole was drilled at each bilateral injection location. 0.2 μL virus (0.1 OD) was injected per site using a Hamilton microsyringe (0.02 μL/min) into the dorsal DG using the following coordinates: anterioposterior = − 2.2 mm from bregma; lateral = ± 1.5 mm; ventral = 2.3 mm. The skin incision was closed carefully after adenoviral injection to minimize inflammation. Injection needles were left in place for 5 min before and after injection to ensure right location and even distribution of the virus. Age-matched, genotype-matched male B6 mice (middle-aged 10 months) were used for all behavioral experiments. Contextual fear conditioning (CFC) and spatial learning were performed in separate cohorts. For CFC, mice were trained 4 weeks after adenovirus (mTerc-53/mTerc-53r/con) injection. For spatial learning, mice were trained 8 weeks after AV (mTerc-53/mTerc-53r/con) injection. The contextual fear conditioning (day 0) protocol entailed delivery of a single 2 s footshock of 0.8 mA, 180 s after habituation of the mouse in the training context. The mouse was taken out 10 s after termination of the footshock. Freezing levels were quantified over the 180 s habituation phase prior to the shock. On day 1, animals were exposed to the training context (in which they did not receive a shock) for three minutes to test the 24 h recall. From the end of 24 h recall to the initial of 1 mos. recall, mice were kept in their own home cage respectively. On day 30, animals were exposed to the training context (in which they did not receive a shock) for three minutes again, to test the 1 mos. recall. Conditioning was conducted in TSE multi CFC arena with clear front and back Plexiglas walls, black side walls, and stainless-steel bars as a floor. The arena was lit from above with a light, given back sound by a speaker, ventilated with a fan, and encased by a sound-dampening cubicle. Mouse behavior was recorded by digital video cameras mounted above the conditioning arena. For the training context (designated A throughout), the fan was on, the room light was on level 500, and the back sound was on level 1 as a white noise. Stainless-steel bars were exposed, and 1.5% HAc was used as an olfactory cue. Mice were brought into the training arena in a standard housing cage. Animals were counterbalanced for order of recalls, with the second exposure occurring 29 days following the initial test. TSE multi conditioning system software was used for recording and analyzing freezing behavior. The task was performed with one training phase: acquisition phase (11 days, Q4). A probe trial, in which the mice were released at the center point at the edge of the Opposite quadrant and allowed to swim for 60 s in the absence of the platform, was performed 24 h after the last trial of the acquisition phase (day 10) and twice 3 days after the first probe. The animals’ trajectories were recorded with a video tracking system (EthoVision XT). The apparatus consisted of a white pool 120 cm in diameter and 60 cm deep, filled with water to a depth of 45 cm. Four black shapes were equally spaced on the walls of the room as visible cues. Water temperature was maintained at approximately 23 °C by an automatic thermostatic system. A clear Plexiglas goal platform 9 cm in diameter was positioned ~0.5 cm below the surface of the water (hidden platform), approximately 30 cm from the wall of the tank. Latency and frequency to reach the platform were recorded for training trials, while swim distance in quadrant were calculated for probe trials. 3 trial sessions were performed on days 0–10, with mice released facing the wall in the center point of the edge of each quadrant except Target quadrant, in a pseudorandom order such that no single start location was used in consecutive train (~1 h. interest interval). Mice were allowed to swim for 60 s, and the animals that failed to locate the platform in this time were guided to the platform and allowed to rest for 30 s before being removed from the tank. The latency to reach the platform was averaged for each day. Probe trials were performed on day 11 and day 14, with mice released facing the wall in the center point of the edge of opposite quadrant. Mice were allowed to swim for 60 s before being removed from the tank. Mice were gently dried after each trial in both training and probes. Statistical analysis was carried out using GraphPad Prism software. Unpaired one-tailed Student’s t-tests were used to compare three groups or to compare preference for each quadrant in each group. To compare groups across training days for the Morris water maze, two-way repeated measures ANOVA was used. For contextual fear conditioning, behavioral data were scored by TSE multi conditioning system software. The sample size was chosen based on a previous study (McAvoy et al., 2016) and its power was validated with result analysis. Blinding was applied during the experiment. Randomization was used for selection of animals for each behavioral experiment. Following anesthesia, mice were sacrificed, and heart perfusion with 4% PFA (EMS) was performed. Whole brains were rapidly harvested and post-fixed in 4% PFA at 4 °C for 24 h. The brains were then embedded in 2% agarose. Coronal brain sections (35 μmol/L) were collected from vibrating microtome (Leica Inc. Germany). The slices were dried on cation coated slides at 4 °C overnight and stored without coverslips at −20 °C until ready to use. Slides were then taken out of −20 °C and dried at room temperature for at least 30 min. All sections were antigen-retrieved with citrated acid buffer (pH 6.0) in a microwave oven, permeated with 0.5% Triton for 20 min after washing with PBS, and blocked with 5% GBS in PBST (0.2% Triton) at room temperature for 2 h. The sections were incubated with primary antibodies diluted with 5% FBS in PBST at 4 °C overnight. The next morning, the sections were washed 4 times with PBS, then incubated with secondary antibodies in the dark, washed again, and then mounted with HardSet Mounting Medium (Vectashield) and coverslips after DAPI staining. Slices were scanned with Zeiss Axio Z1 Slide scanner. The primary antibodies include rat anti-BrdU7 (1:500, abclonal), rabbit anti-NeuN (1:500, abclonal), mouse anti-Nestin (1:200, abcam) and rabbit anti-S100β (1:200, abcam). The secondary antibodies include goat anti-mouse IgG Alexa 488 (1:1000, Thermo), goat anti-rabbit IgG Alexa 594 (1:1000, Thermo). For BrdU incorporation, 1 mg/g BrdU in 100 μL of sterile PBS was i.p. injected every 24 h for 1 week before the histological experiments. Slides with brain sections were taken out of −20 °C and dried at room temperature for at least 30 min. Reaction buffers were made fresh: for COX staining, 5 mmol/L DAB and 100 μmol/L cytochrome C were added into 0.1 mL PBS (pH 7.0), mixed quickly, before 2 μg of bovine catalase was added; for SDH staining, 1.5 mmol/L NBT, 130 mmol/L sodium succinate, 0.2 mmol/L PMS, and 1 mmol/L sodium azide were added into 0.1 mL PBS (pH 7.0), and mixed quickly in the dark. Slides were incubated with the buffers for 40 min at 37 °C, washed, dehydrated with gradient ethanol, mounted with Hardset Mounting Medium, and scanned with Zeiss Axio Z1 Slide scanner. Tophat (Trapnell et al., 2012) was used to map cleaned RNA sequencing reads to hg19 genome, and GFOLD was then used for differentially expression analysis (Feng et al., 2012). To identify significantly differentially expressed genes, each candidate gene needs to meet two criteria below: i. GFOLD > 1 or GFOLD < −1; ii. q-value < 0.05. An R package topGO was used for Gene Ontology enrichment analysis. Hypergeometric test was used to measure the significance of GO term enrichments. We thank Dr. Zhenyu Ju for providing us the terc−/+ mice, Dr. Zengcai Guo for the help on histochemical studies, and Dr. Lei Liu for helpful discussion. This research was supported by the Priority Research Program of the Ministry of Science and Technology of the People’s Republic of China 2017YFA0504600, National Natural Science Foundation of the People’s Republic of China grant 31371439, 91649103, and Ministry of Education of the People’s Republic of China 1000 Talents Youth program. Q.Z. performed the Northern blotting, and the senescence assays. P.L. and F.D. performed the histochemical assays. G.G. and Y.C. performed the mouse behavioral experiments. J.Y. analyzed the RNAseq data. P.W., L.X., J.H. and X.L. performed most of the immunoblotting. T.T., J.C., Z.L., J.G. and G.W. conceived the ideas, designed the experiments and wrote the paper. Qian Zheng, Peipei Liu, Ge Gao, Jiapei Yuan, Pengfeng Wang, Jinliang Huang, Leiming Xie, Xinping Lu, Fan Di, Tanjun Tong, Jun Chen, Zhi Lu, Jisong Guan, and Geng Wang declare that they have no conflict of interest. All institutional and national guidelines for the care and use of laboratory animals were followed. This article does not contain any studies with human subjects performed by any of the authors.